When monitoring the health of your agency, are seeing the full picture? Are you keeping track of the cost of doing business to ensure you’re not over-servicing your clients? No matter the size of your agency, it should never just be about billing. It’s important to include margins and profit alongside revenue when looking at those KPIs. Knowing your numbers will help with difficult decisions when it’s time to discuss the next job or to review your retainer agreements. Having a whole team that’s on top of their timesheets is a giant success, but it’s only the first step. If you’re just making sure the actual hours match the estimated hours, you’re missing a crucial piece of job health. Whether it’s billable or non-billable, you want to ensure you’re tracking the cost of everyone’s time associated with a job. One of the biggest money pits on a job can be too many meetings. If you have an internal meeting about an account, there is a cost associated with every person attending. This eats into your profit, and if you’re not including this as part of your job, you won’t know the true cost. You also need to know how much it costs to do the work and what you’re billing for it. For example, it’s not just about knowing how much time someone spent on design. Take a deeper dive and add staff costs to the time they’ve tracked. This allows you to keep a better eye on the margins in your creative project management software. Where else could you be leaving money on the table? We’re always shocked when we see agencies that don’t mark up certain expenses. Knowing exactly what you’re not charging for is as important as knowing what you are charging for. Simple things like a designer sending files to the printer or doing a press check should have billable time associated to it as part of the budget. If you’re not marking up the printing and haven’t accounted for the resources required to get the files out, your profit will take the hit. See how FP increases agency profitability. That’s not to say you need to markup every last modicum of work. It’s about balancing the client’s budget constraints and making sure you’re not eating too much of the cost at the expense of project profitability. Time still equals money, so if you’re not marking up certain expenses you’ll want to ensure that you have budgeted billable “account management” or “project management” time for these kinds of administration tasks that require extra resources. Once you’ve associated costs to time (billable and non-billable), and expenses (external and internal), you can look at the bigger picture. 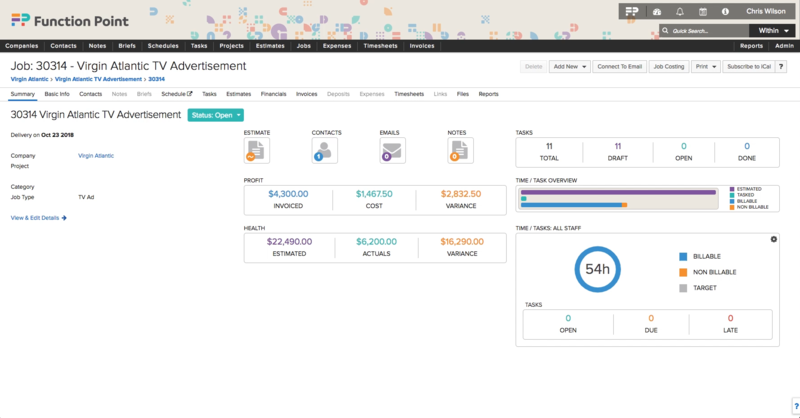 In Function Point, time and expenses data feeds into a job summary. This dashboard in our creative project management software shows you the profit as well as the health of a job. With our Business Intelligence Reporting, you’ll get a full picture of what you are billing, and what your costs and margins are. Leveraging this data helps you make more informed business decisions, based on profit rather than just revenue. You’ll know exactly which projects or services have the highest/lowest margins, solidifying your understanding of where the opportunities to grow certain areas of our business are. At the end of the day, revenue is only one part of the equation. Understanding your margins and costs are essential pieces of the business puzzle that will help you track project performance, so you’re repeating only the profitable ones.